Brace yourselves, a fifth Sharknado movie is happening. Greg Berlanti’s latest DC superhero show could find a new home on the CW. Bryan Singer discusses the tone of the new X-Men TV show. Plus, see the Rangers in action in a new Power Rangers poster, and new pictures from Powerless, The Magicians, and Iron Fist. All the Spoilers! The film’s official Facebook page has shared a new synopsis for the film. It appears the film has a new logo that’s even more retro than its previous one, if this Kirby-as-hell art department shirt from production is anything to go by. The runtime is 135 minutes, according to the Berlin Film Festival’s program. The Rangers and Zords fly into action in the final—and perhaps actually best—poster for the film. Pixar has released a first look at the short that will precede the movie, Lost & Found, in which a sentient lost-and-found box fights back against a playground bully. We could [see her in Season 1]. As I say, never say never, but it’s certainly within the realm of possibility. The one thing that’s tricky is, there will always be a genre, mystery element to this show, but it’s hard to introduce a supernatural element. I think there’s a way to introduce Sabrina in a way that’s not supernatural, but she is, she’s a witch. Delightful news, but perhaps not too surprising, considering that the CW and Archie Comics are looking to make more TV shows together, including one based on the beloved teenage witch. 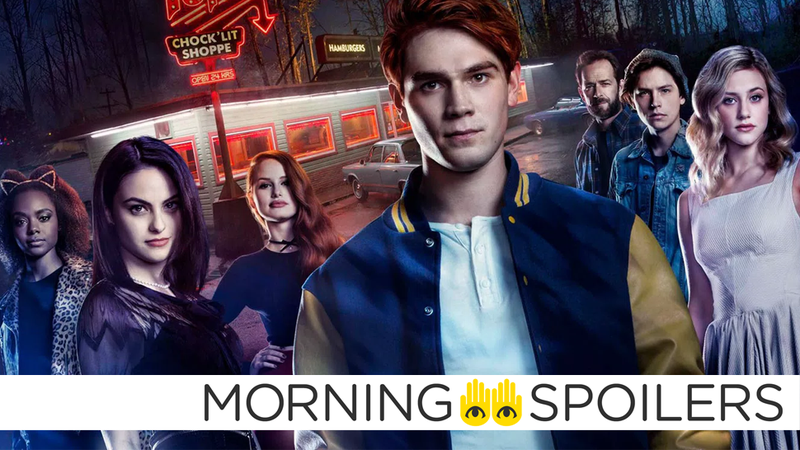 Could Riverdale stealth-launch a Sabrina show? The pilot for Greg Berlanti’s superhero series based on the classic black DC character is no longer being made for Fox according to Deadline—and may in fact actually end up moving to the CW and becoming part of the Arrowverse. Even more CW superheroes for everybody! Bryan Singer discusses the family aspect of the show that differentiates itself from Legion and the X-Men movies. When internet sensation Logan Macdonald comes to town, a supernatural infection hits, via a viral video. Meanwhile, Molly has a frightening vision that could predict a bleak future. Can the team cure the curse before it takes over town? Quentin and Penny embark on a quest; Margo works on a way to help Eliot; Julia seeks an old friend’s help.